In retrospect, it is probably difficult to appreciate how quickly the sixties soured beyond 1967. Although street lore from the period tended to blame an infusion of heroin, methamphetamine and impure LSD—all supposedly from organized crime—one can hardly hold the Mafia accountable for what marked 1968 in terms of broad social upheaval and unmitigated violence. To cite but two telling figures: While felonious crime rates commenced a three-decade climb to historically unprecedented levels, a hundred and twenty-five American cities erupted with riots and more than four thousand politically motived bombings. Then, too, there is this to consider: although military-backed psychiatric experimentation failed to isolate that means of shaping the perfect killer, the hallucinogenic spillover into the streets of San Francisco had everything to do with the shaping of Charles Manson. “Oh Lord,” Ron was said to have exclaimed when apprised of United States usage rates circa 1968, “time has caught up with us.” He then went on to describe his vantage point as somewhat remote. After seven years in the south of England, 1968 had found him in and around the Mediterranean aboard his famed research vessel, Apollo, where even the more cosmopolitan ports of call in Spain and Portugal would not feel the psychedelic tidal wave for several years to come. 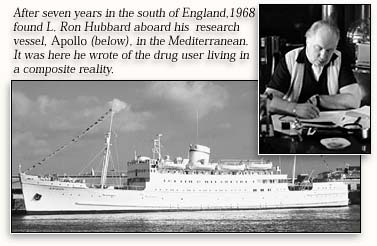 Moreover, his crew, drawn from the world of Scientology, was wholly drug-free, and so it was not until continued growth of the Church brought commensurate needs for new recruits that he even glimpsed that notoriously strange Class of ’68. 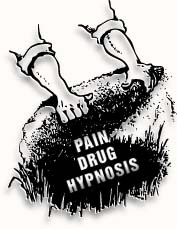 As a preliminary observation, he described the former user as delusory, inattentive and prone to “blank” periods—all, incidentally, accounted for within the psychedelic lexicon as “spaced-out,” “zoned-out” and “gone.” He additionally noted a marked weakness in both written and verbal comprehension, and sorely deficient communication skills. Then too, he spoke of the user as living in a “composite reality,” with no distinction between past and present, and otherwise exhibiting behavior with real parallels to insanity. Finally, and herein lay the primary point of LRH concern, the former user proved utterly incapable of advancement through Scientology. The problem would prove insidious, considerable and complex. But for the moment let us focus upon what he described as the biochemical barrier to mental and spiritual advancement, and specifically as regards LSD. Again, a word on the irony is appropriate. After all, here was the original psychiatric ticket to altered states and expanded consciousness, the key to those legendary doors of perception at only five bucks a hit. The catch, however, was veritable scars on the soul which proved all but permanent.